Posy Trudeau, the designer behind Civvies just released two pairs of drawn jeans. I’m showing today the “Hellbound” one. I know you have probably enough pairs of jeans in your inventory, but these are different and might catch your interest! First, they come in two versions, to wear with or without a provided prim belt. Second, this belt is moddable, comes in two pre-sized versions, and last but not least, has a shape that, actually, fits avatars’ shapes, which is so so rare! Third, they are nicely textured, with attention to details, but without that now terribly dull (IMHO) “photorealistic” flair. But wait, there is more! Two pairs of cuffs are provided (two sizes), moddable, and those are sculpted in a very clever way which fits shoes without passing thru them. This kind of cuff could make me appreciate prim cuff attachments for pants, although I’m usually not fond of them. Note that one of the cuffs show drawings on it, which helps to integrate it with the rest of the pants (and must have been a hell of a lot of work to do, as everyone who has sweat at texturing sculpties knows). Also showing: boots and choker from “Body And Soul Tracks,” at very sweet prices, a tattoo set from “Negko Design” (which is now in a new location, see the address on the address page). 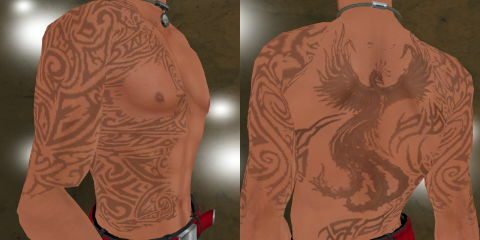 See details of the tattoo below. Plus another nicely drawn tee shirt from “Hazard” (comes on jacket, shirt and underpants layers), and a hair/hat combo from “Exile.” Enjoy! 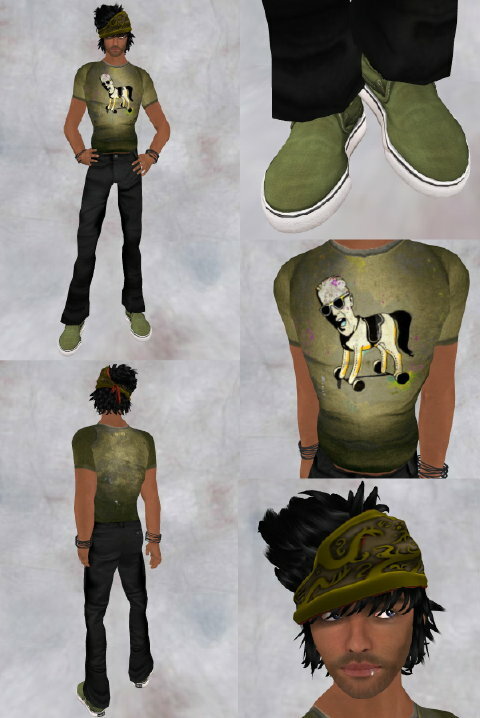 A while back, I showed another t-shirt from Hazard, part of a collection of quirky, odd shirts with amazing graphics, as well as nice shading and texture. Here, I’m showing “Disturbed,” featuring a crazy cartoon head (Max Headroom?) on a dog’s body. I can’t lie and say it doesn’t disturb me! These t-shirts come on several layers, both jacket and shirt, plus an underwear extension for low-rise pants. The new Gypsy hair from Defectiva is wild and fun, a mess of hair jutting out of a wrap that is script-changeable. I like Disembodied Hand’s hair work. It’s adventurous and unique, with nice textures and a playful air. Shown here is the classic bandanna pattern. Okay, first off, these corduroy pants designed by Posy Trudeau, from Miau Haus, are some of the best fitting pants for guys on Second Life. Posy’s always been one of my favorite pants designers, and these cords, in many colors, are my new favorite pants. Nice, tight fitting, excellent texture, cool colors (I’ll show more on a later post). I’m wearing the black ones here. On top of these pants, the best belt I’ve seen so far on SL. Sorry for all the superlatives, but seriously, this belt is great, sculpty and menu-driven for shape (waist and 3 kinds of low-rise), texture (lots to choose from, I chose solid green here after messing with a bunch of different designs), and color. It fits my somewhat small av without a lot of trouble. Thanks to Kid Kokorin for a nice piece of work. The t-shirt is Kid’s as well. 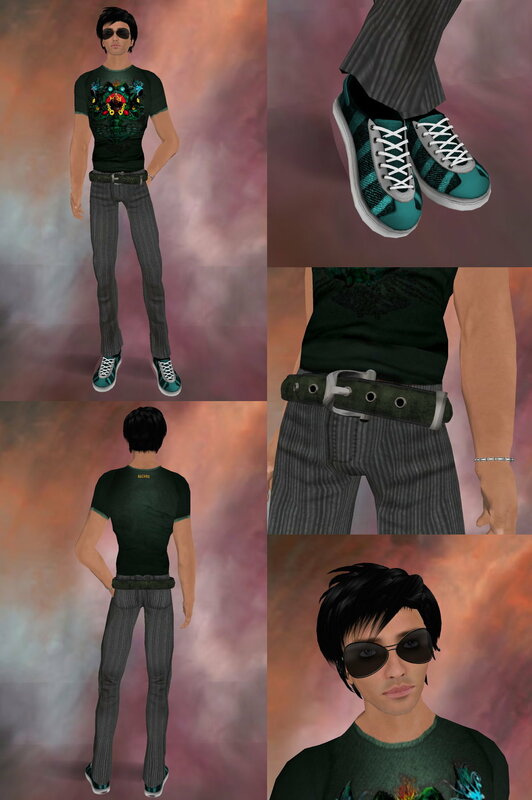 This design is called “Arcadia.” He has a good selection of odd (but cool and very inspired!) t-shirts. Rodney Trenkins’ shop, Republik, offers these “Fight Club” glasses as well as the Grunge shoes shown. Shoes are menu driven for size, texture, and color. I love the trend toward this easy way of adjusting prim clothing. Finally, the Men’s Square Link Black Titanium Link Bracelet from Dahlink’s, delicate links of black and silver, resizeable by…menu!